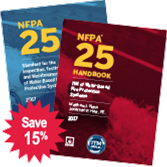 Keep sprinkler systems in top shape with the new 2017 edition NFPA 25 Set. Conduct ITM correctly to help ensure fire protection systems are ready to function as designed. Sprinklers are proven to reduce fire tragedies and loss, but even the best-designed and installed system can fail without proper ITM. Do your best to correctly inspect, test, and maintain sprinklers properly to keep them in top condition and ready to respond if fire strikes. NFPA®'s money-saving 2017 edition NFPA 25 and NFPA 25 Handbook Set is the power-packed resource team you need on the job. Get the complete picture on water-based fire protection ITM procedures and how to implement them correctly. Order your NFPA 25 Set today and save!